When you are running a website in Wordpress, there may be times when you want to change a User's role. For example, you may want to allow a subscriber to contribute to your site. In this tutorial we will show you how to change the Role of a Wordpress User in the Dashboard. In my tests I am changing from a Subscriber to an Administrator. Logging into your WordPress Dashboard as an administrator. 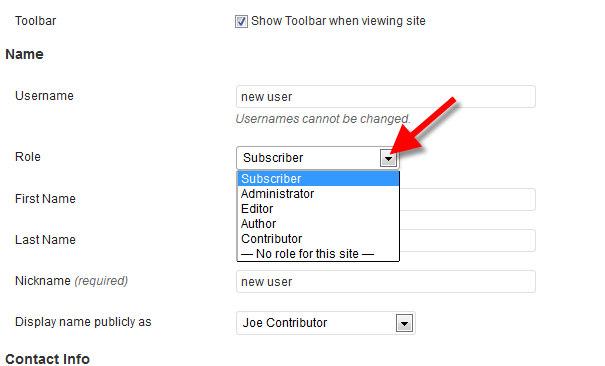 Click the Users link in the Navigation menu, then click the username that you want to change the role for. Click the drop-down box located to the right of the Role option. Turn basic caching on or off. This option caches your site's blocks based on the block's setting. Concrete5 recommends turning this off when you are troubleshooting issues. Administrator Turn overrides caching on or off. If this is on it will cache the page, no matter what the cache setting for the block is. Editor This option allows you to cache the full web page in concrete5. If On - In all cases is selected it will cache the full page regardless of the block's cache setting. Author You can set how often the full page cache is rebuilt and saved. Automatic will clear cache based on concrete5's default settings. You can also set it in minutes, or manual. Contributor You can set how often the full page cache is rebuilt and saved. Automatic will clear cache based on concrete5's default settings. You can also set it in minutes, or manual. No role for this site You can set how often the full page cache is rebuilt and saved. Automatic will clear cache based on concrete5's default settings. You can also set it in minutes, or manual. After making your selection, click the Update User button. 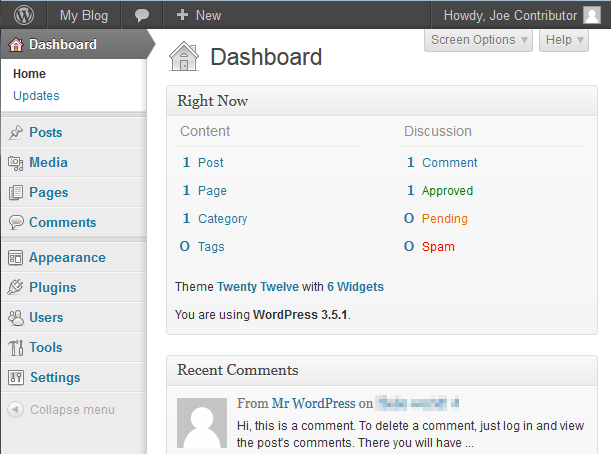 Congratulations, now you know how to modify the role of a user in the Wordpress Dashboard.